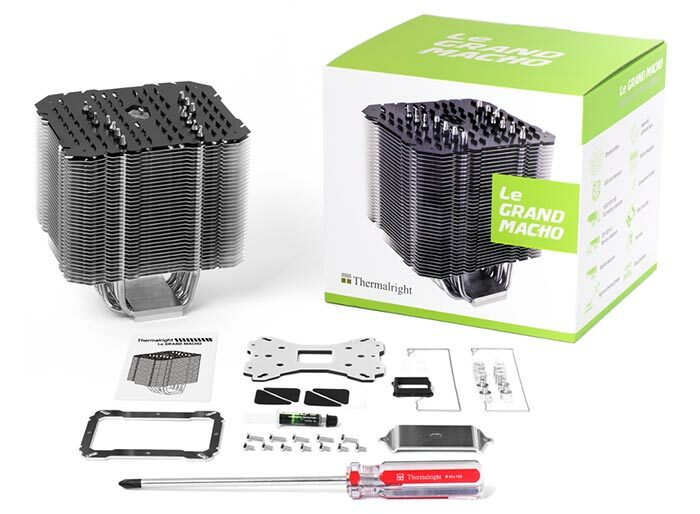 Thermalright has launched a new passive/active cooler called Le Grand Macho. Passively it can cool CPUs with up to 95W TDP, and if you fit it with a pair of optional 120mm fans you can cool up to 300W TDP. 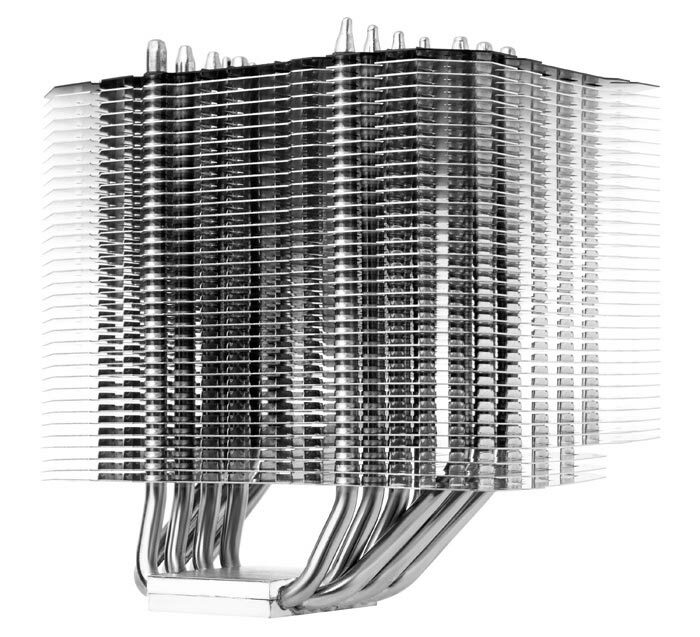 The guys over at FanlessTech brought Le Grand Macho (7 heat pipes / 900g) to our attention and explained that it "fits the gap between the affordable Macho (6 heat pipes / 710g) and Thermalright's flagship HR22 (8 heat pipes / 1120g)". Like the original Macho, Le Grand Macho, features a black top for aesthetics. However Le Grand Macho has more substantial properties in common with the flagship HR22, sharing that cooler's size and cut out design, for RAM clearance. Thermalright says that the offset design of Le Grand Macho provides more breathing space for your graphics card. It is equipped with a nickel plated "enlarged copper base" for full coverage contact with your CPU. Le Grand Macho is compatible with the following motherboards; Intel Socket LGA 775/1150/1151/1155/1156/1366/2011/2011-3, and AMD Socket AM2/AM2+/AM3/AM3+/FM1/FM2/FM2+. Thermalright has tested the cooler in a variety of 'real world' ATX and microATX PC systems. Sadly we don't have pricing or availability details from Thermalright, at the time of writing. EKWB Vector Radeon VII water block launched Deepcool shares info about its patented anti-leak technology Thermalright HR22 Plus black passive cooler spotted Thermalright Silver Arrow TR4 Threadripper cooler launched QOTW: Which CPU cooler do you use? I am with Tiger on this one… they are just so heavy I mean 900g hanging off a motherboard is a little worrying in my eyes.